Learn how to create and customize coding tests. Login to CodeSignal and click on TEST. 2. Scroll down to the ALL TESTS section and click + ADD NEW. 3. 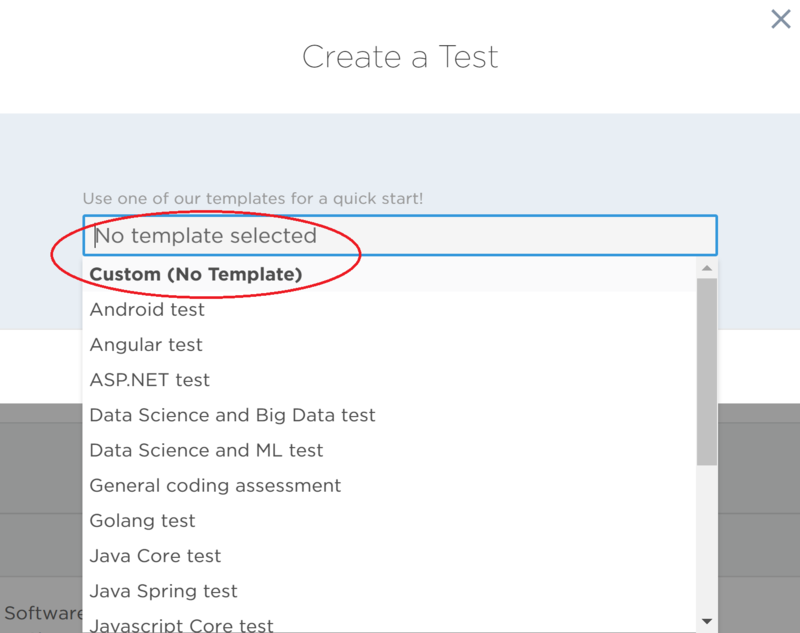 You may select a pre-existing template or move forward with No Template Selected to create a new test from scratch. 4. Enter a Title for the test and select a Duration. This is the amount of time that candidates will have to complete the test once it has begun. We recommend keeping the test brief at 90 minutes or less). Click + Add Tasks to choose tasks from our task library. 5. By default, we will show you any tasks you have previously Favorited. Click ALL TASKS to view the entire library. Once you have identified a task you would like to include in your test, click the circle icon in the top left corner of the task to select it. Click the arrow toward the bottom right of the screen to proceed. You can limit solutions to your task to a specific language or multiple languages. By default, all languages available for a given task will be selected. To narrow the languages in which developers can write solutions, unselect "Select All" and choose your languages of interest. Additionally, on this page you can also assign a specific score to your task. By default, coding tasks are worth 300 points, but you can increase or decrease this score as you see fit. Click DONE to save your selections, and add more tasks as you see fit. Best Practice: For the best candidate experience, we recommend including 2 or 3 coding tasks within a 90 minute test. To finish creating your test, click on CONFIGURE DETAILS. Learn more about configuring the details of your test here. When you’ve finished customizing your new test, click CREATE. Congrats! You've just created a new test to send to your candidates. Learn how to send your test to developers here. Questions on how to create or configure your test? Please email [email protected] to get in touch with us!